The Central Texas Community Veterans Day Parade will march through historic downtown Killeen Monday, November 12, at 11 a.m.
KILLEEN, Texas — The Central Texas Community Veterans Day Parade will march through historic downtown Killeen Monday at 11 a.m. Retired Lieutenant General H.G. “Pete” Taylor will serve as grand marshal. The parade is focusing on honoring Operation Desert Storm and Desert Shield soldiers and veterans. Parade entries will be accepted through Nov. 11 at avac-centex.com. There is no cost to enter. The parade route travels from College Street down Avenue D to Eighth Street, Eighth Street to Sprott Street and Sprott Street to Gray Street ending at Avenue C.
The city said spectators should arrive early to secure the best parking and viewing spots along the route. 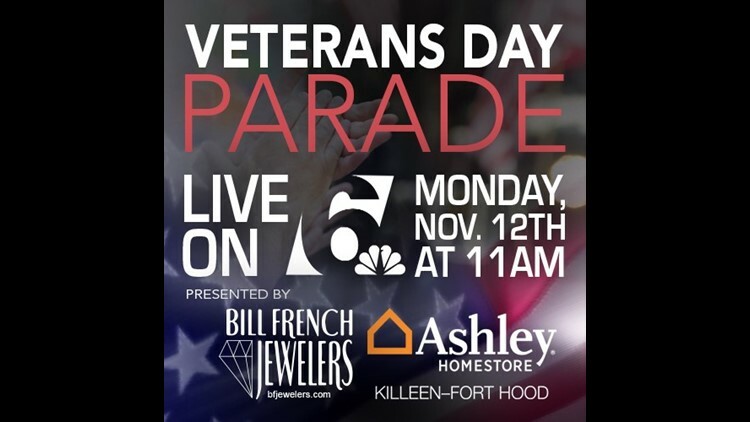 The Department of Veterans Affairs selected Killeen’s parade as a regional site, one of just four in Texas. An official certificate will be presented to Mayor Jose Segarra prior to the parade start, the release said.